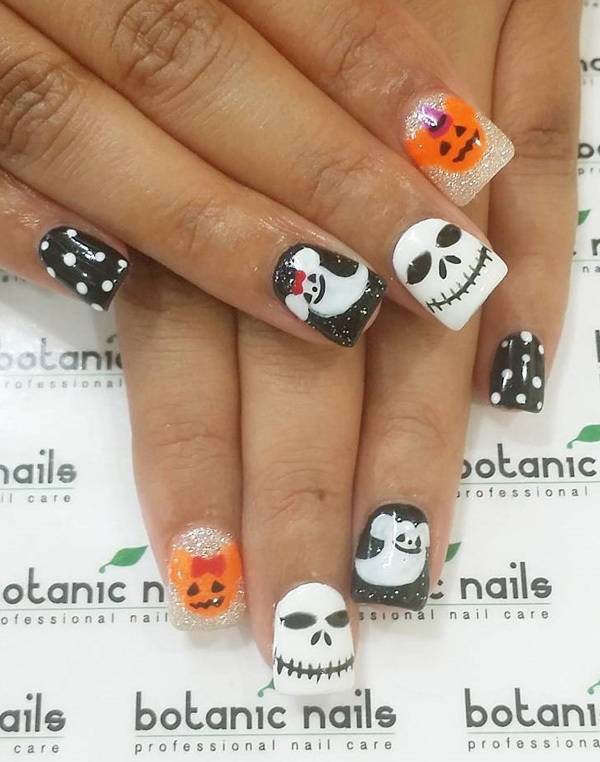 What better way to accompany your Halloween costume than to don some really cute and spooky Halloween nail art? Halloween is a time to be creative and you can simply go out of your way to get that perfect Halloween look that you have been planning for months. 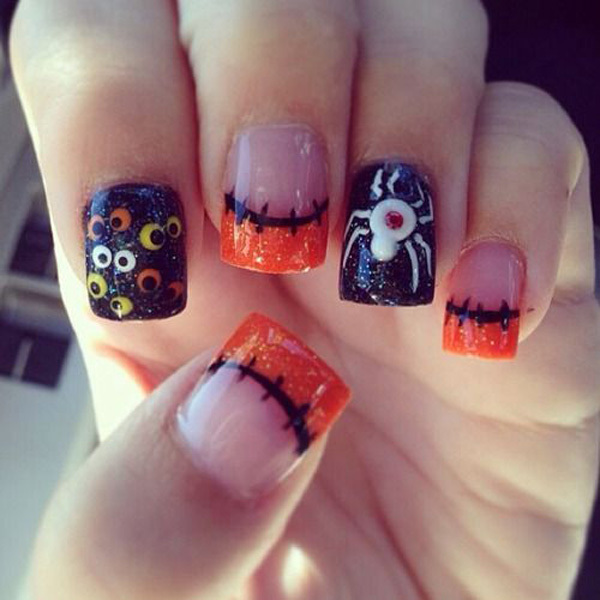 Halloween nail art can help improve your costume or enhance your makeup. No matter which way you use it, you will definitely have fun in making and wearing it. Prepare neon and black polish for your skull nails. This is to help enhance the skull effect by dulling the background and giving the skull a very loud and daunting effect. This nil art is perfect for with costumes or even throwback retro outfits. To start choose at least five neon polishes of your choice, the more variety the more life will be given to your skull nails, if you want to go with just a single color then you can do so as long as it fits your costume theme. The black polish for the skulls should at least be black lacquer; this is so that the skulls will not chip that easily. Even though you say that you will protect the design with the clear coat on top, it still helps that the skull polish itself is long lasting. Start by applying the neon base coats on your nails. Double coat if not even enough and make sure they are dry before applying the skull designs on top. Begin your skull art by painting two oval shapes alongside each other; these will serve as the skull’s eyes. Paint the ovals near the base of your nails as the skulls will be facing you from base to tip of the nails. Draw the nose by painting a heart upside down. Or you can also try painting two ovals that slant towards each other and connecting in the middle. You can then proceed to draw the teeth with a striper brush or a simple toothpick when you don’t have one. You can even use a dried out felt tip pen for more precision drawing. Do the same for the rest of the nails. When you are done, make sure that the skulls are dry before you coat the top off clear polish. This nail design is a more farfetched one and will involve a lot of colors and painting. Since zombies are pretty messy and gory, you will have to exercise your inner goriness and fascination with brains; the zombies’ all time favorite snack. Find the most number of nail polish that you can scrounge. It is also important that you get the perfect green color as your base coat. Some other important colors that you ought to secure for the perfect zombie nails are black, red, yellow, white and purple. You can combine these colors to create blood, dirt and bruises. Start by painting on your base coat. Make sure the base is dry before you coat your top colors. It’s good to try uniform colors such as green for your nails. This can give you the full effect of zombie nails. 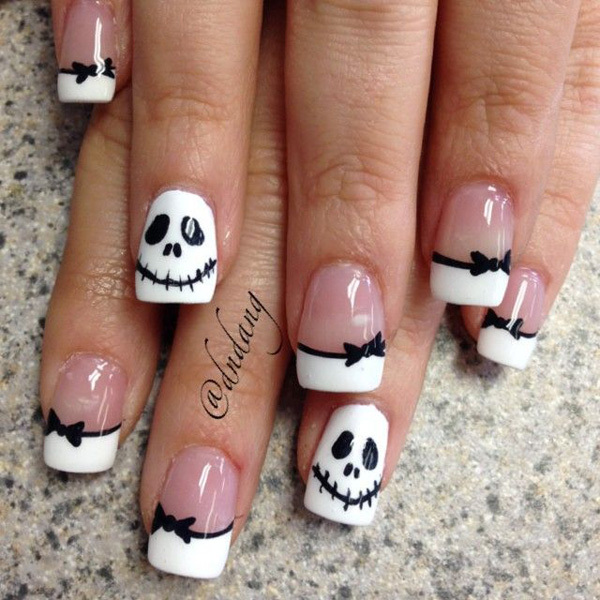 Compared to skull nails. You can be more creative and free with the zombie nails. It is important to plan out what you want your zombie nails to come out. You can try painting on blood splatters with the red polish as well as scary eyes and stitches. You can also try cutting off some masking tape to shape them as protruding teeth from your nails. The outcome of your zombie nails depends on the theme you are working on, when you are only showing one hand in your costume then you can go for blood splattering on your nails. Or you can customize claws and add protruding eyes for effect. The grosser the better fit for your zombie nails. Just bear in mind that you should be comfortable with the nail art you choose for Halloween. 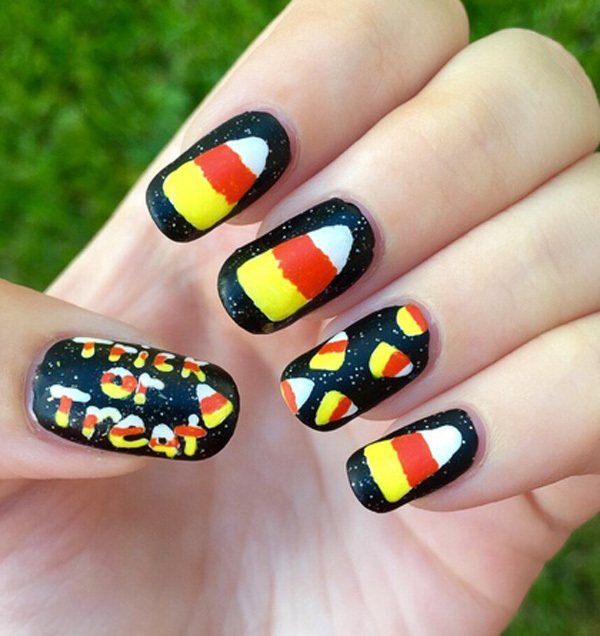 Make sure that the nail art does not chip easily and will not damage your costume in any way. It would be bad if either one of your nails or your costume will get damaged when you are out there trick or treating. Last but not the least, don’t forget to enjoy! Halloween only comes once a year and the best way to pull off a costume is to feel good about it and also feel good about yourself. 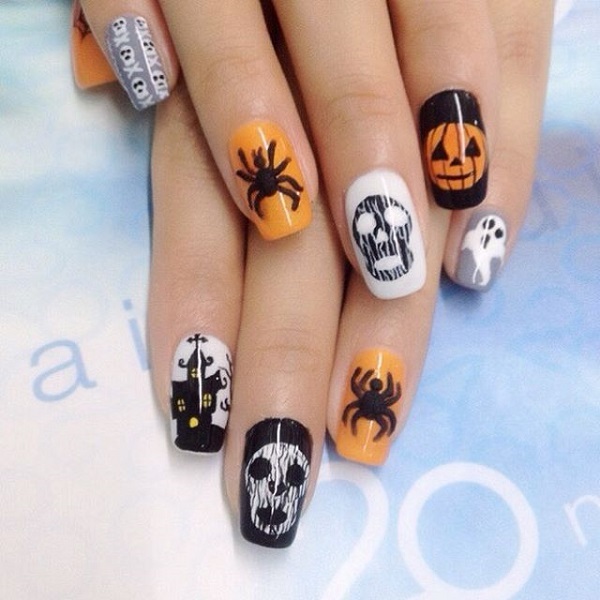 Go out there an spook everyone with your one of a kind Halloween nail art! 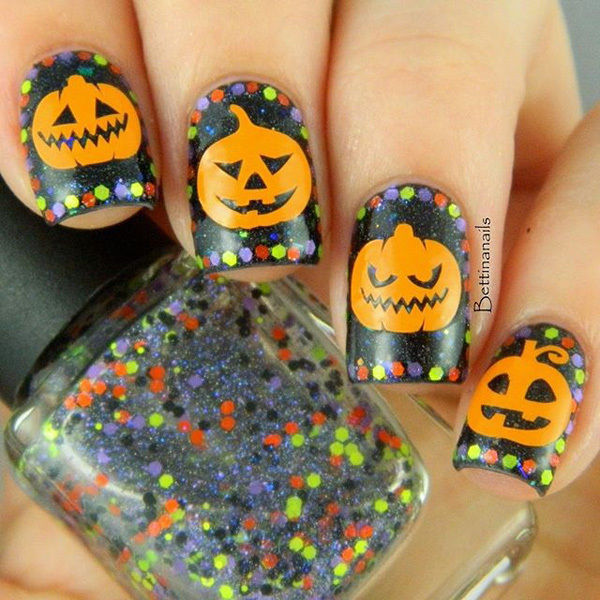 Quirky and funny looking pumpkin inspired Halloween nail art. Make use of gradient nail art techniques and add glitters and ribbons on your nail for effect. 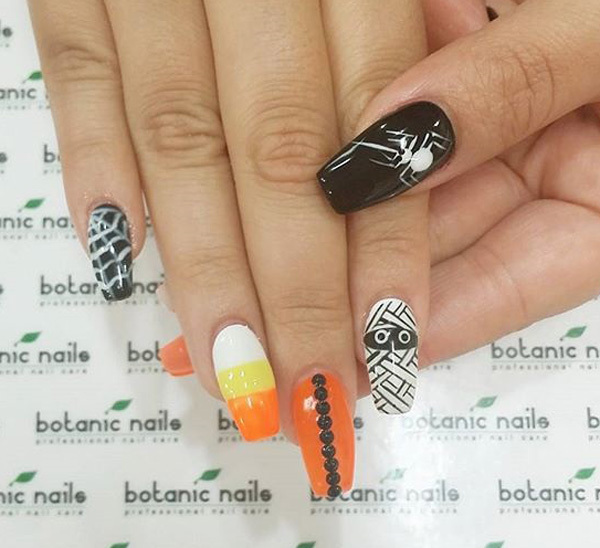 Spider and web themed Halloween nail art design. Let your French tips take a horrifying turn with this black and orange color combination. 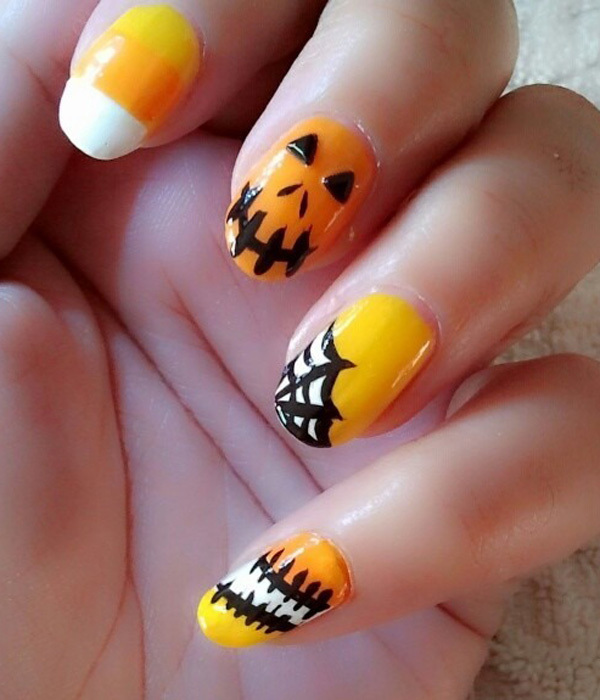 Very cute pumpkins Halloween nail art design. Spice up your French tips with pumpkin details in black and orange polishes. 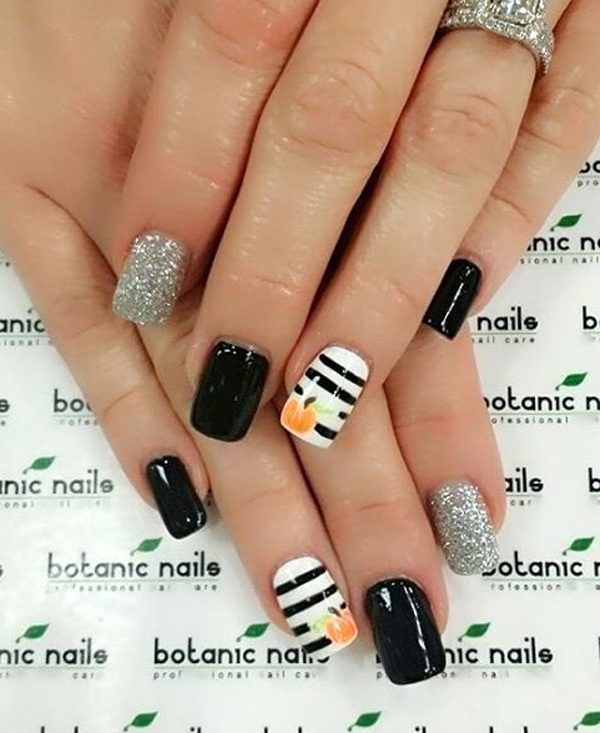 Add a touch of glamour into your spooky nails with this black and white themed pumpkin nail art design. 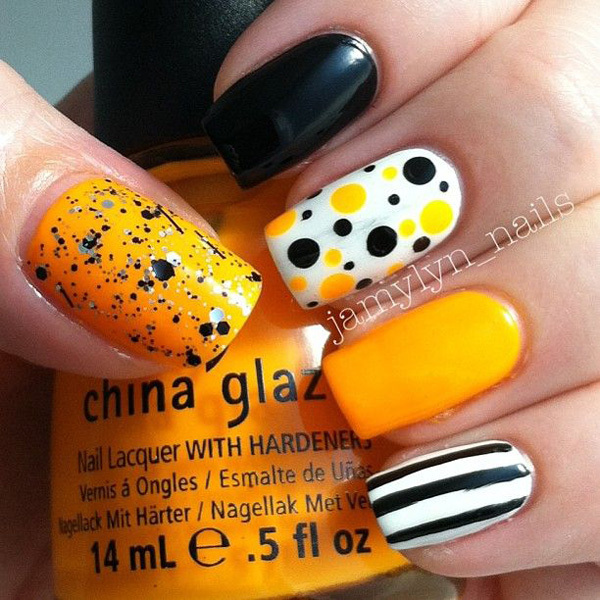 Use black and white as your base colors and paint on pumpkin details on your nails. You can also finish off with silver glitter paint. 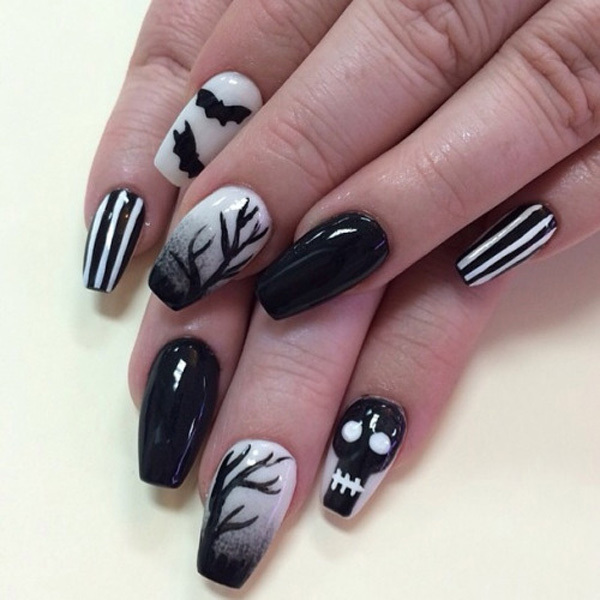 A ghastly looking Halloween nail art design. 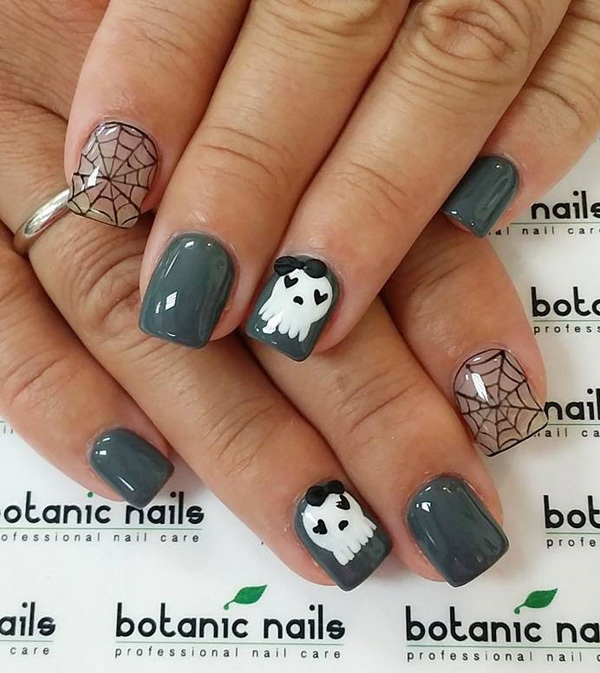 Draw ghosts and cobwebs on your nails to celebrate the Halloween and top it off with a clear coat to make it last long. Halloween colors inspired marble nail art. 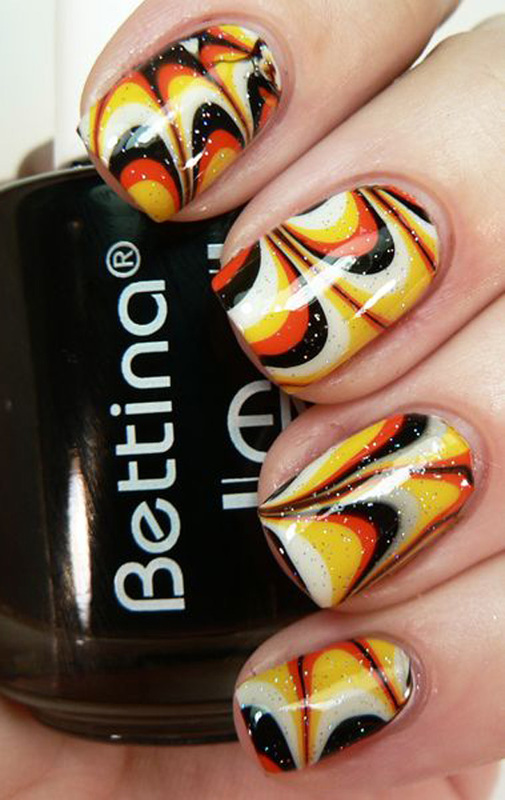 Combine popular Halloween polish colors such as orange, red, black, white and yellow to form eccentric patterns on the nails which are pleasing to the eye. 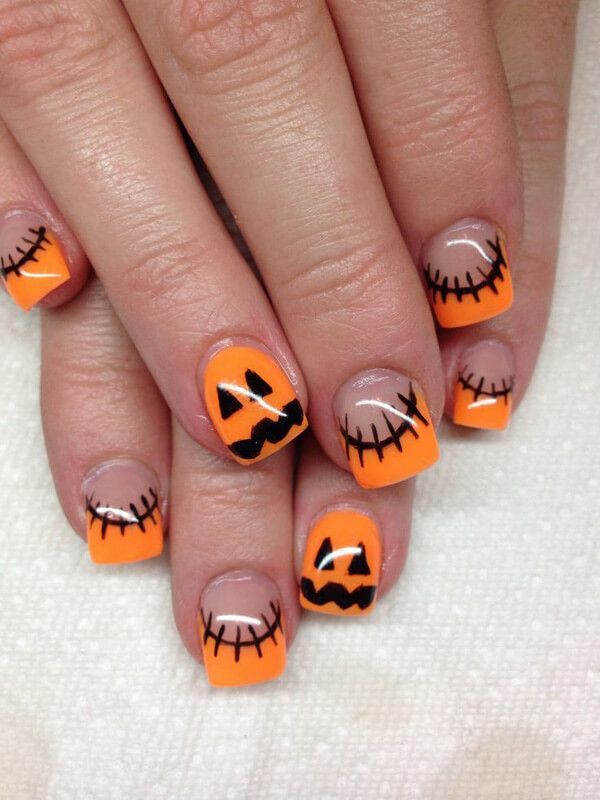 Creepy pumpkin heads Halloween nail art. Paint on scary pumpkin faces on your nails with black polish as your base coat and silhouette. Use an orange coat to paint on the details of the pumpkin faces. Cute and charming black cat Halloween nail art. Draw on cute black cats as your French tips for this Halloween. 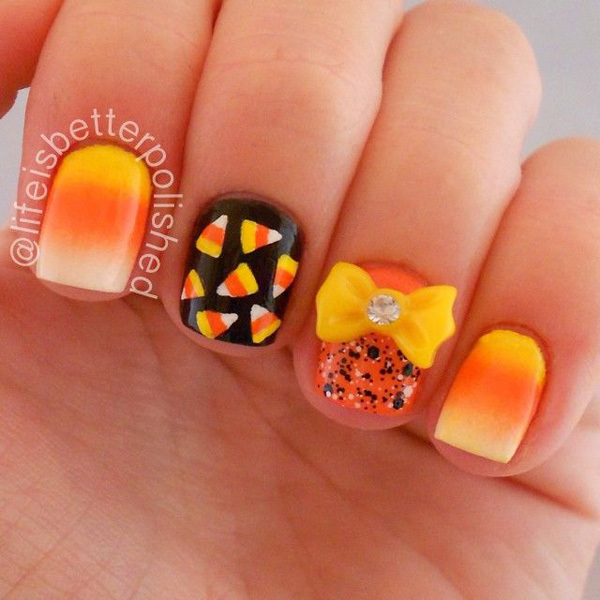 Adorable looking pumpkin and stripes Halloween nail art design. You can also paint on other Halloween characters such as mummies and Frankenstein to create variation. 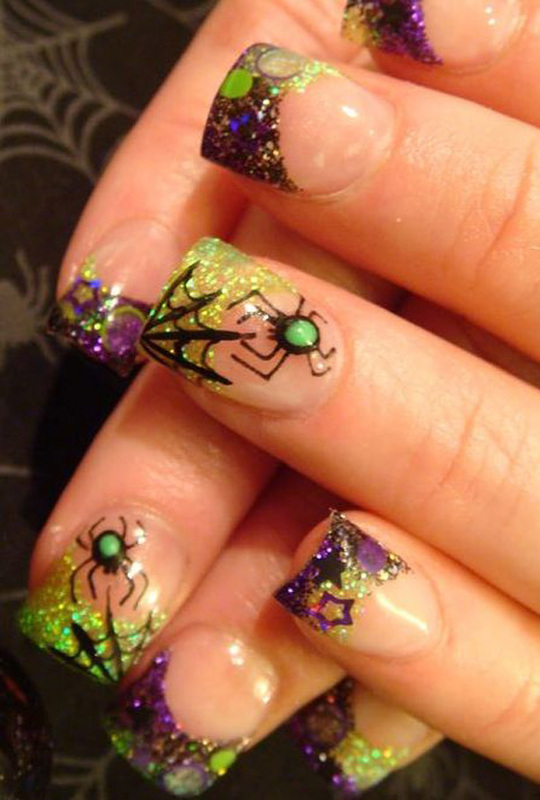 Spiders and cobwebs inspired Halloween nail art. 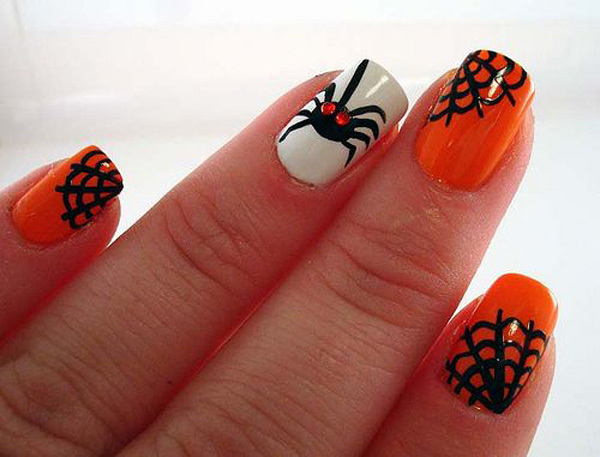 Use white, orange and black polishes to create the spider and cobweb details on your nails. 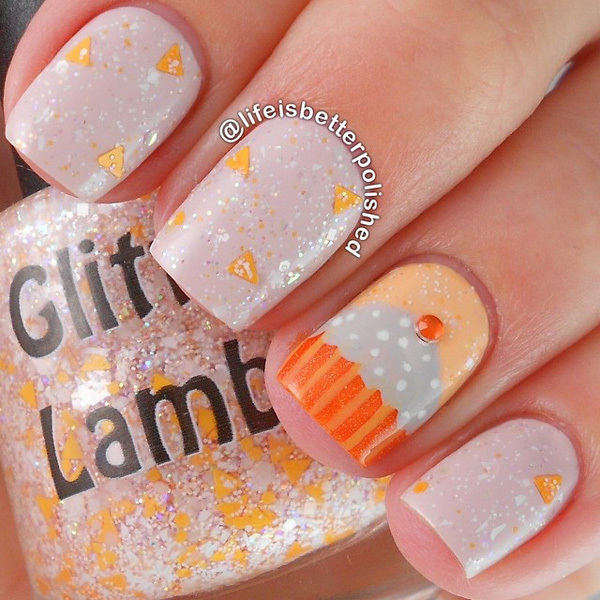 You can use the orange and white polishes alternately as base colors. 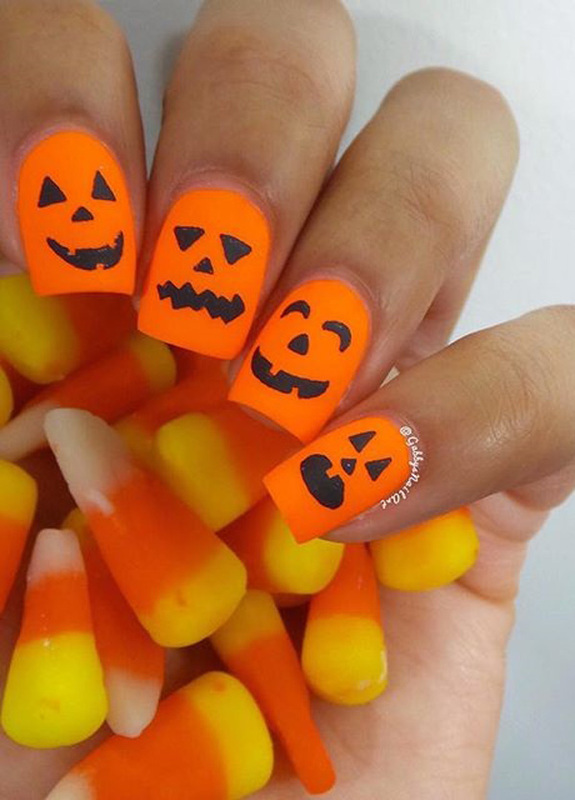 Get more quirky with this fun looking Halloween nail art design. Have fun with orange and black glitter paint and don’t forget to add creepy eyes and a huge spider to complete the look. 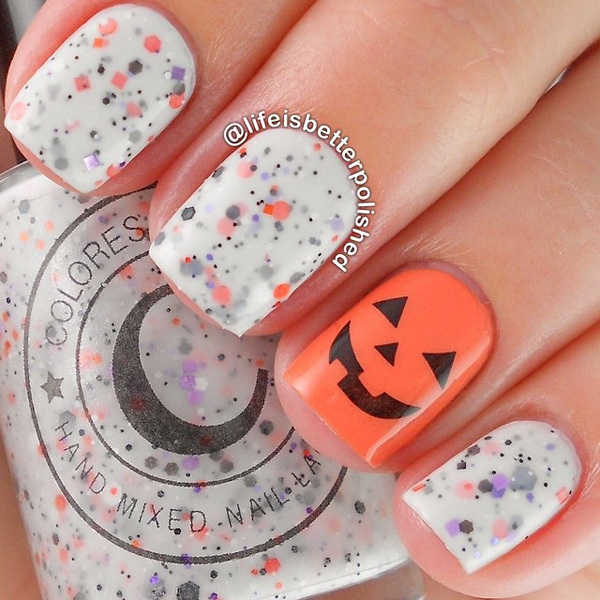 Give life to your nails w this Halloween with this spooky looking nail art. Use gray polish as your base coat and paint your heart way with ghosts and creepy pumpkin heads on top. Halloween color themed nail art design. Play along with Halloween shades and create abstract designs such as polka dots and stripes to add attitude to your nails this Halloween. 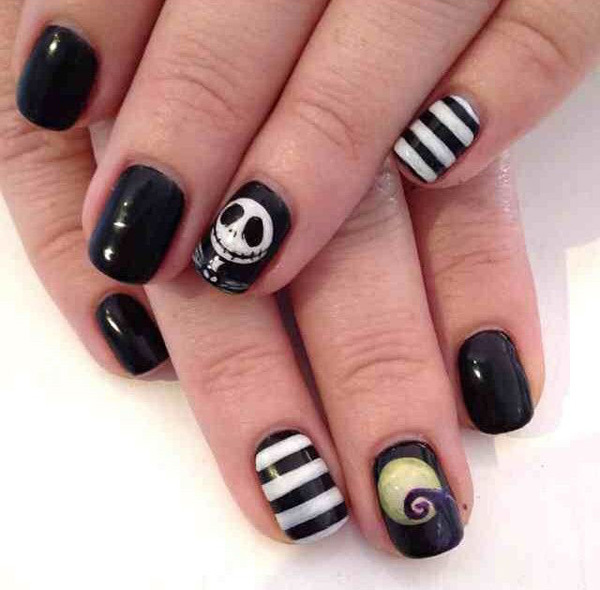 Black and white A Nightmare before Christmas themed nail art. 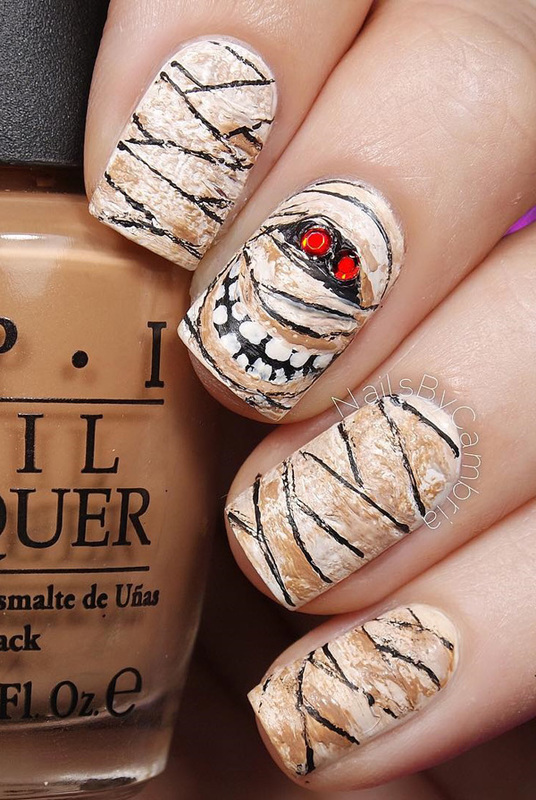 Celebrate Halloween wit this classic tale of creepiness on your own nails. 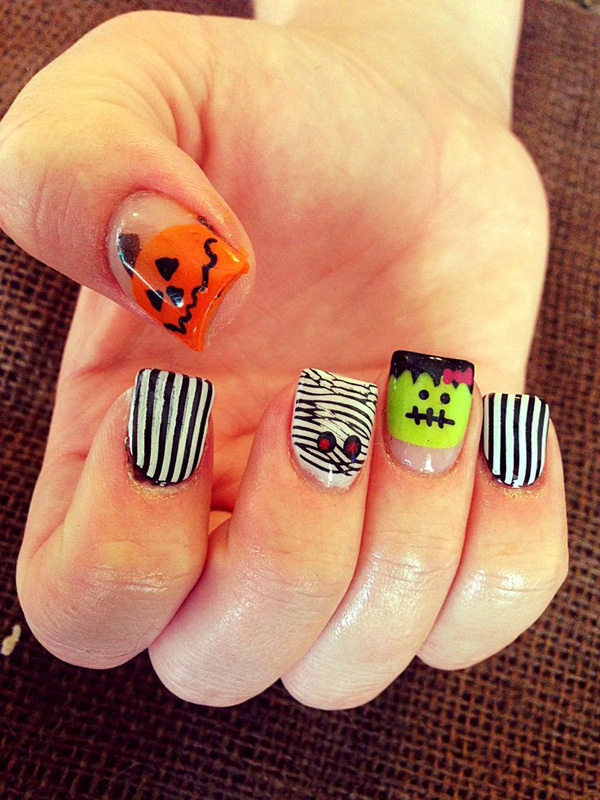 Have fun in recreating the ghastly character on your nails accompanies by black and white stripe designs. 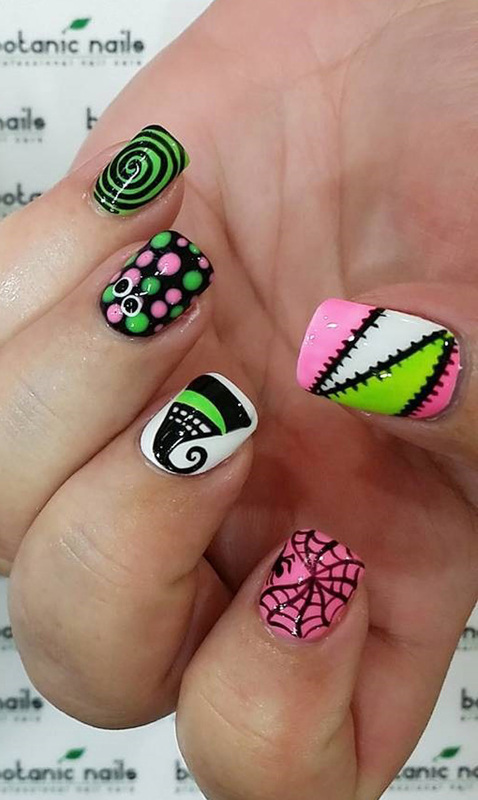 Go neon with this bright and bubbly looking Halloween nail art design. Use black and other neon colors as your base coat and paint n random shapes and lines on top using contrasting colors. These look even better at night. 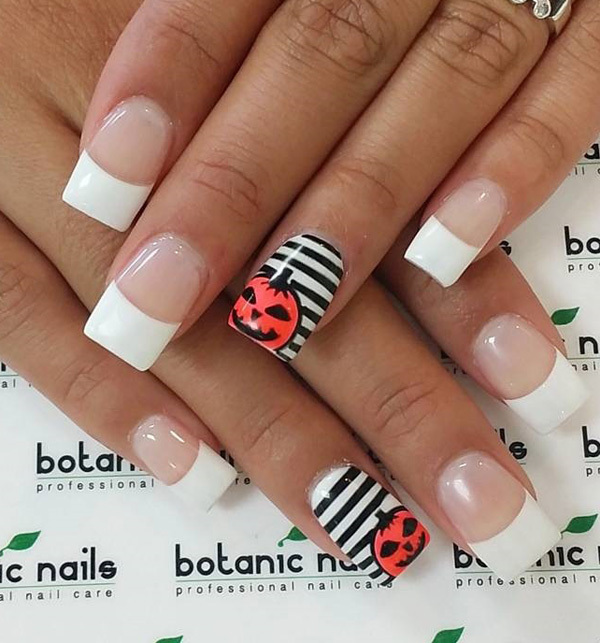 Spider and cats have made their way into Halloween nails and now it’s time for the bats to shine. 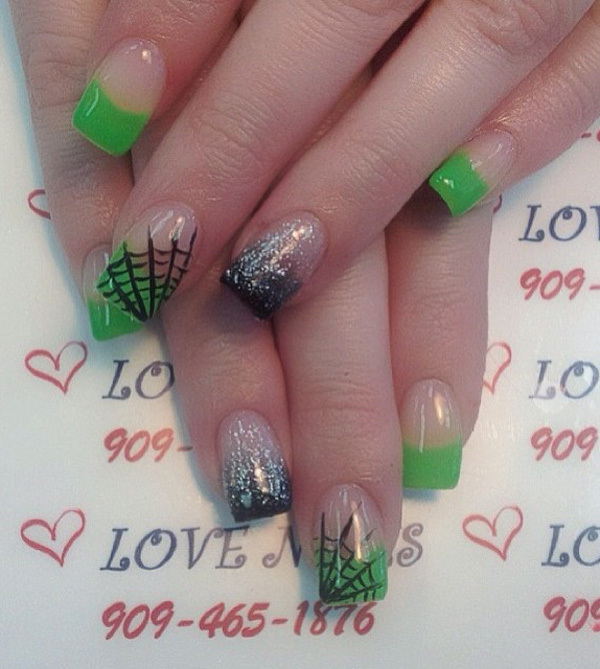 Make your French tip look a lot more exciting with these black Halloween bats hovering around. Give life to your Halloween nails with wonderful glitter pant. Paint on small spiders with cobwebs on your nails and add cute little details such as stars to complete the look. 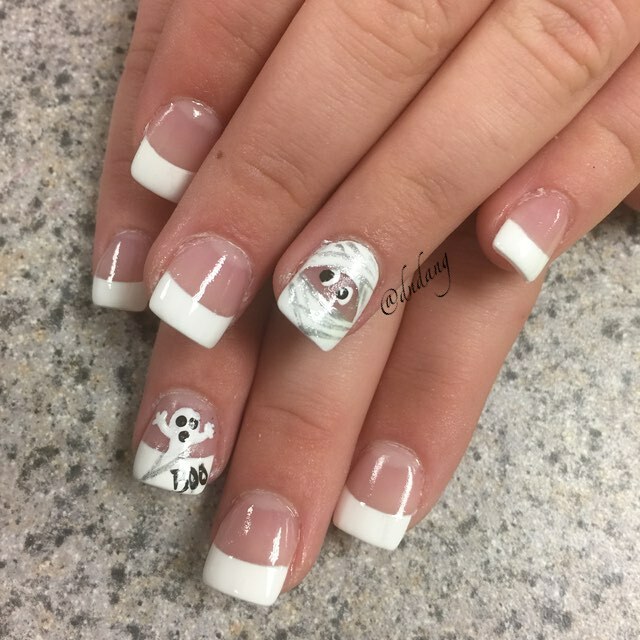 Mummy and ghost inspired Halloween nail art design. A simple white French tip has never looked any better than with mummies and ghost out and about for spookiness. Another Nightmare before Christmas inspired Halloween look. The black and white combination of the design makes it look really classy and cute at the same time. Add ribbons to complete the adorable effect. Dripping pumpkin juice inspired Halloween nail art. 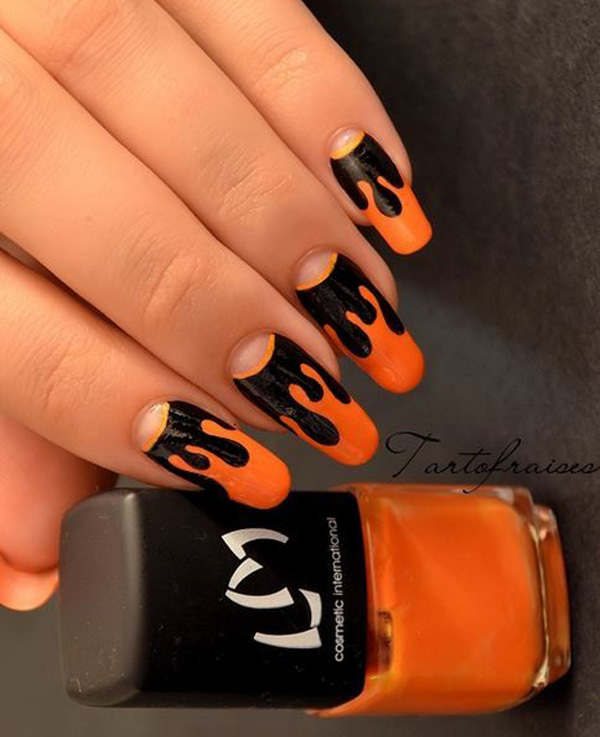 Coat your nails in black and orange polish to depict the dripping pumpkin juice on the tip of your nails. 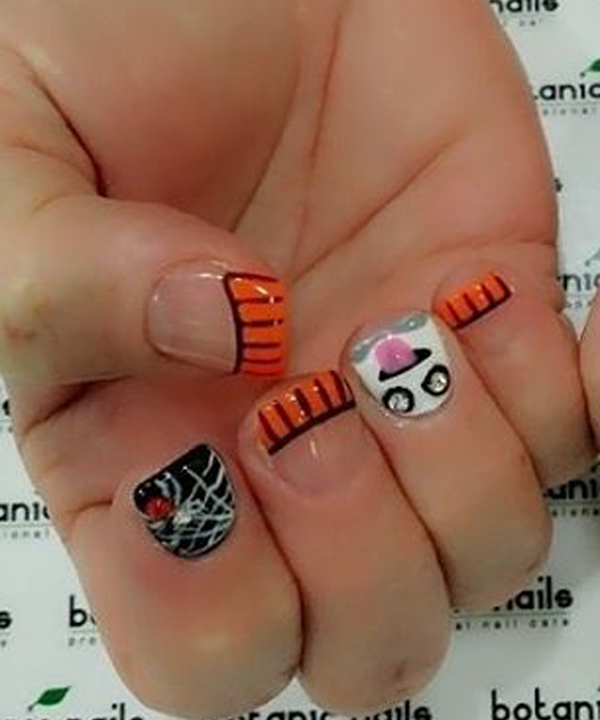 Cute Halloween characters nail art. Use various colors of polishes to paint on different Halloween characters on your nails. The more variety the more interesting they look. Stitch line inspired Halloween nail art. Paint on dark and bold stitch lines on your nails that sew together different colors. Intricate and detailed Halloween nail art. Play around with black and orange polishes while drawing cobwebs, pumpkins and laces throughout your nails. 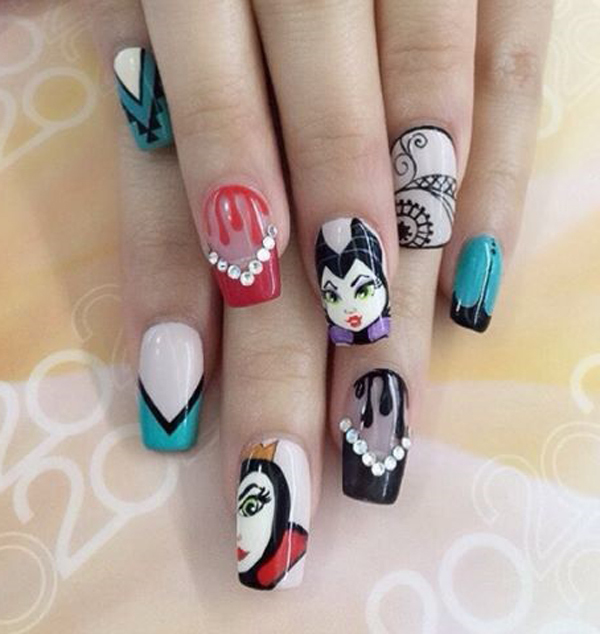 Get creative with these Halloween characters on your nails. 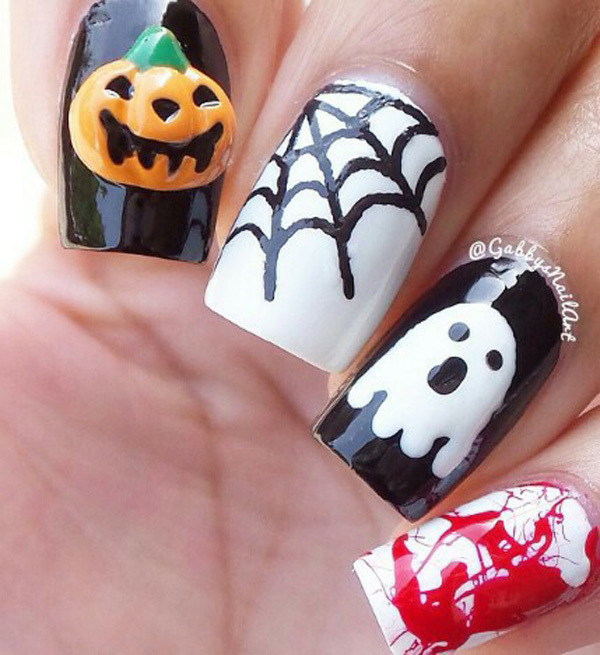 Draw pumpkins, ghosts, cobwebs and blood splatter on your nails to make them look even more interesting. Skeleton faces on bloody red nails Halloween nail art design. Spice up your costume by drawing spooky skeleton faces on top of your bloody red nail polish base coat. 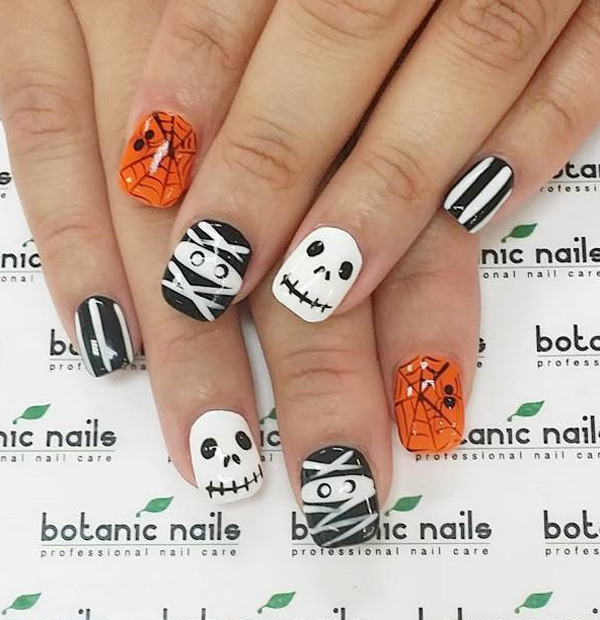 Trick or treat inspired Halloween nail art design. Coat your nails in glitter sandwich style while painting on top details of trick or treat words and colors. 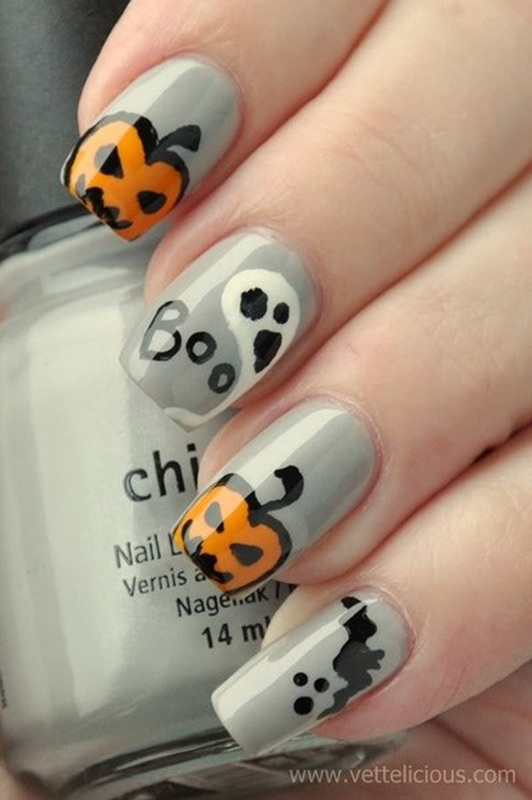 Simple and cute Halloween nail art. Have classy green glitter French tips while drawing bold stitch line on your cuticles. 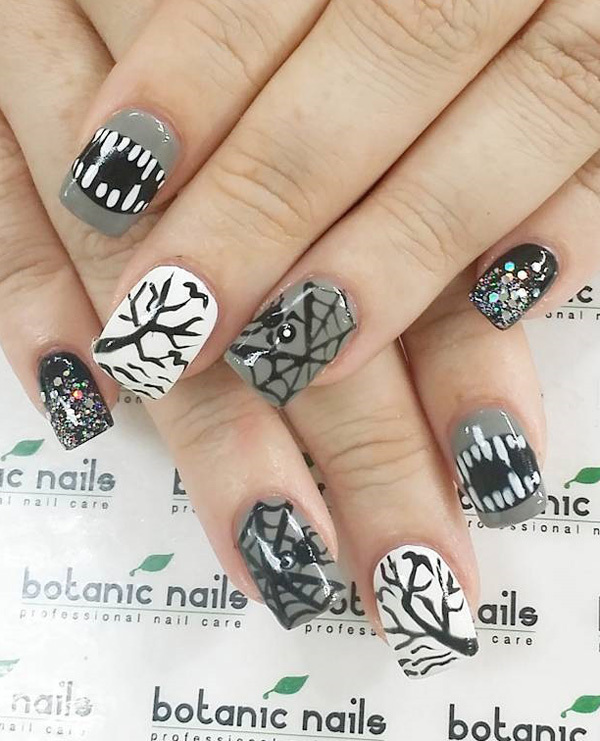 Black and white themed Halloween nail art technique. 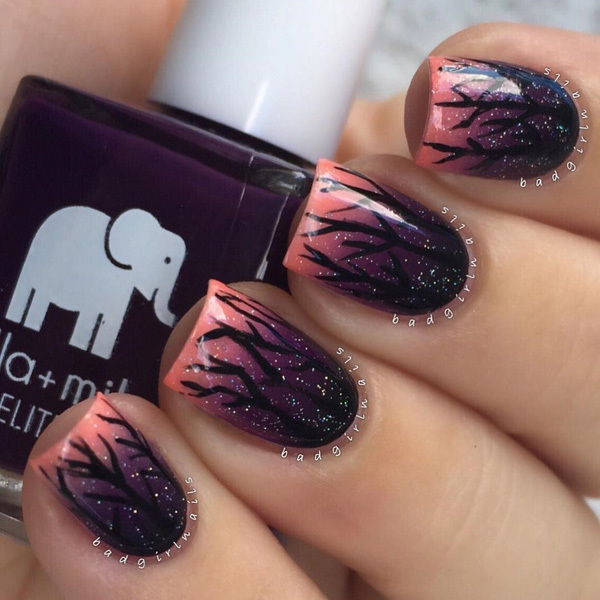 Play around with smoky tree silhouettes, black skeleton faces, bats and stripes on your nails. You can also use black matte polish for variety on your nails. Cobweb inspired Halloween nail art design. Use white polish as your base coat and matte green glitter polish as well. 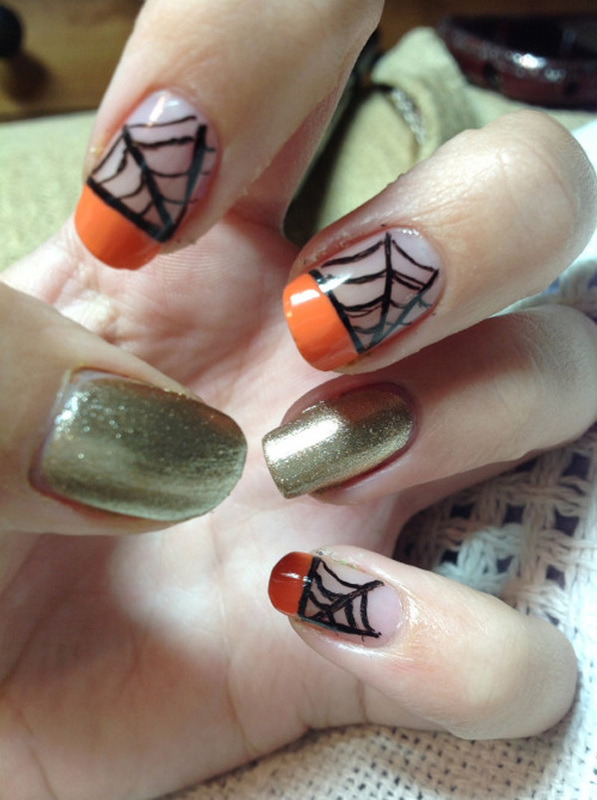 You can then add French tips in orange polish with cobwebs drawn in black polish. 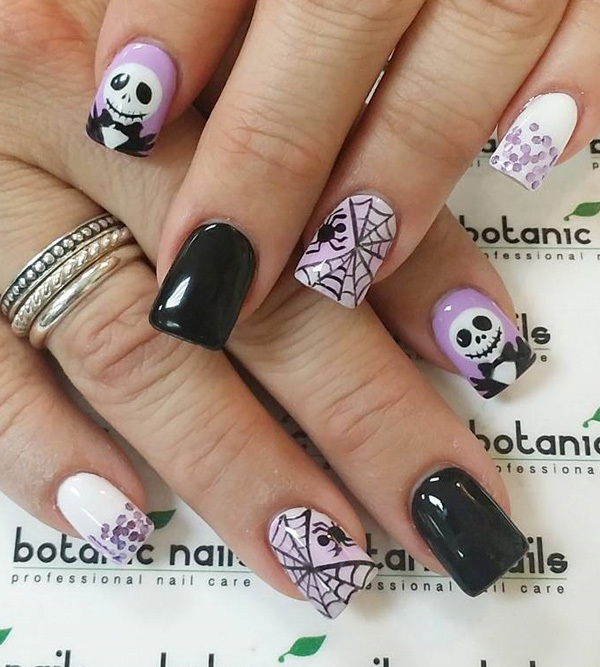 Scary skeleton faces nail art for Halloween. 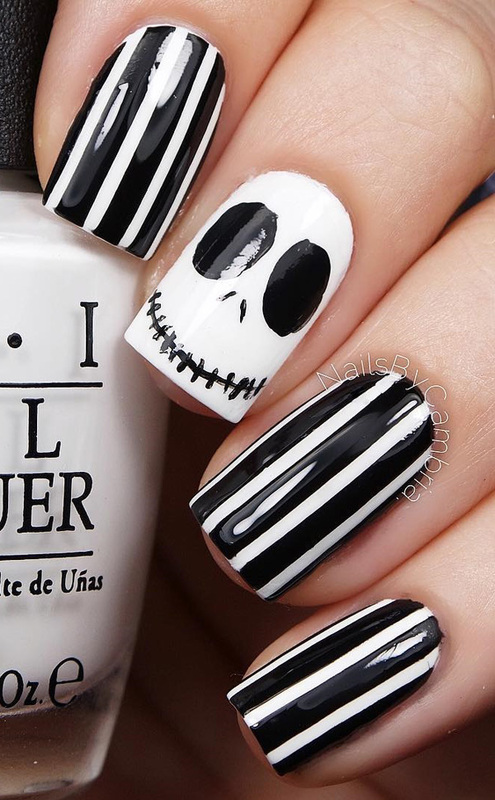 Make your nails extra spooky with these Halloween skeleton faces painted in white polish against a black base coat. 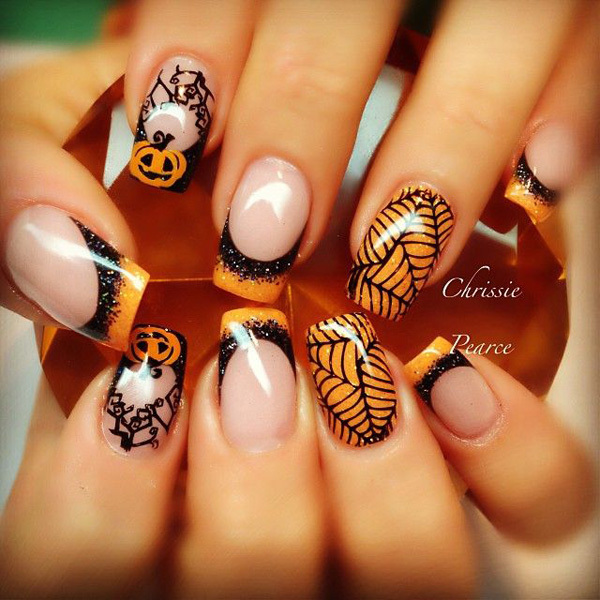 Happy Halloween pumpkins nail art. 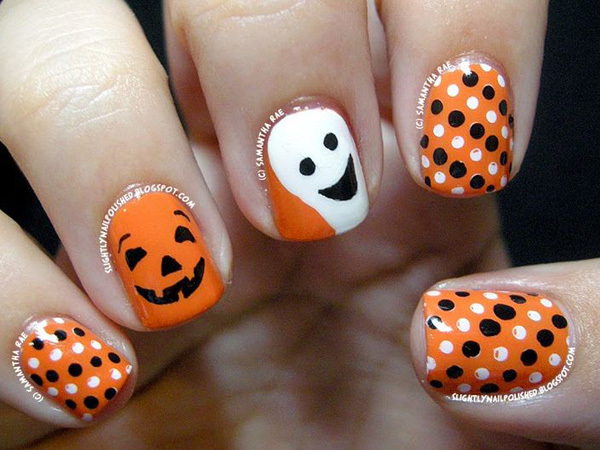 Decorate your nails in orange, black and white polish forming smiling pumpkin and ghost faces. You can also add polka dot designs. 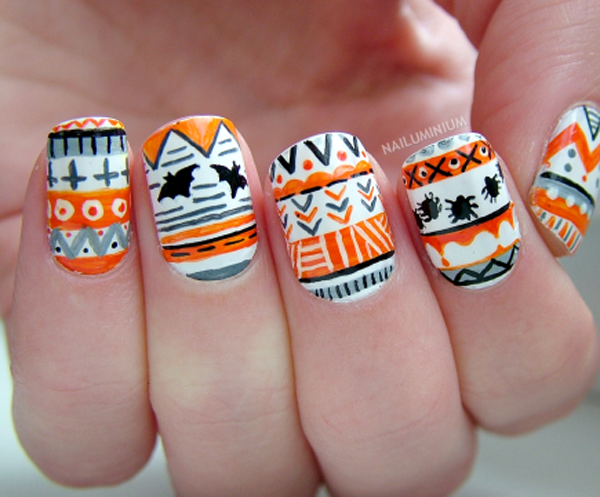 Crazy tribal inspired Halloween nail art. Have fun with creating Halloween characters on your tribal inspired nail art. Play along with colors such as white, orange, blue, black and more to get the effects you want. Try out this bloody mouth Halloween nail art design. Give terror to your nails by painting a mouth with bloody fangs along with splattered blood all over your other nails for effect. 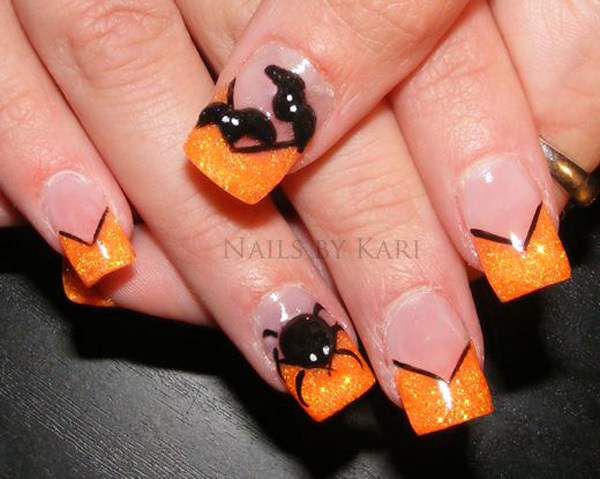 Pumpkin and cobwebs inspired Halloween nail art. 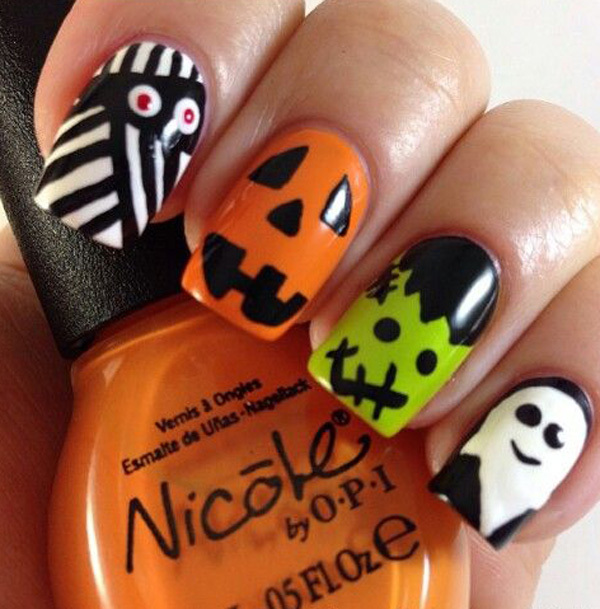 Make your nails stand out with white, orange and black polish, painting on scary pumpkin faces, cobwebs and stitches. 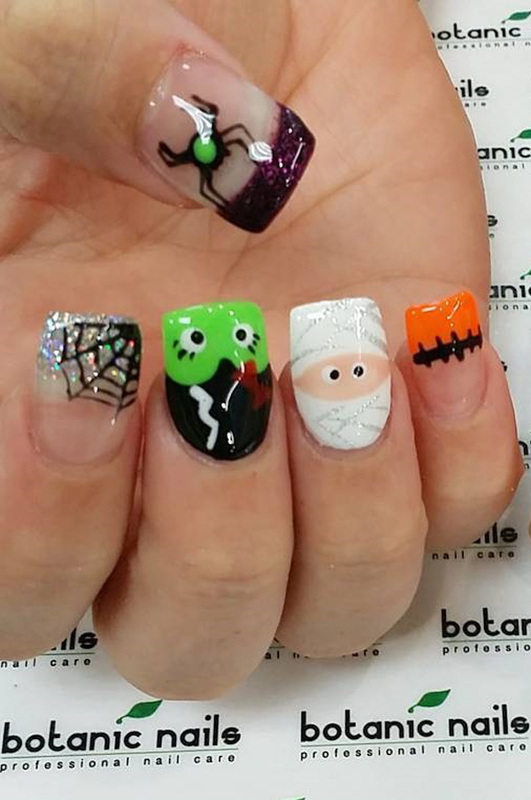 A very cute Frankenstein inspired Halloween nail art. Use a green base color that also serves as Frankenstein’s skin. You can also add minor details such as spiders, webs and gore splatters on your nails. Skeleton inspired Halloween nail art. 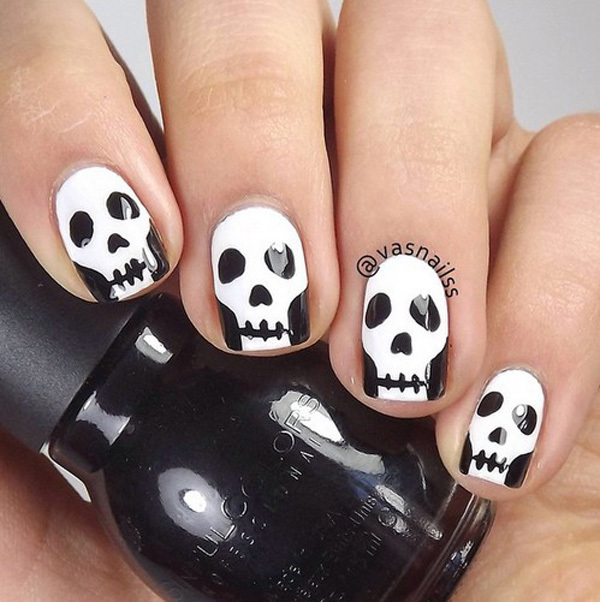 If you are going as a skeleton on Halloween then this is the perfect nail art for you. Use black and white polish for the base and skeleton details. Creepy cemetery inspired nail art design. The foggy base color helps make the black polish silhouettes of the cemetery look even spookier. The bloody red polish also helps in adding the freaky factor. Scary pumpkin head faces Halloween inspired nail art. Add more spook into your Halloween by painting on creepy pumpkin faces on your nails using black and orange nail polish. This is all very STUNNING WORK!! I’m amazed at the details achieved and I’d love to know where your located ? If close I’d definTly come get my nails done from you for Halloween as its my FAVORITE HOLIDAY!! !